Firm founder and lead lawyer Daniel Rodriguez began life as a migrant farm worker. Growing up, he traveled with his family to and from Texas, California, Arkansas, and other states as they followed the crops from state to state. They were constantly on the move. This lifestyle forced Rodriguez and his brothers and sisters to attend three to five schools each year. This turned out to be a blessing in disguise, because in doing so, he learned to quickly size up friends and foes – was that the school bully coming to beat him up or was it a student coming to welcome him? He developed the skills needed to build a quick rapport with almost any individual. These skills would later become invaluable in showing and guiding jurors to make the right and fair decision in a case. We serve those who are in the most need: the victims of car and truck crashes, oil field accidents, defective and dangerous products, excessive force by over-aggressive police, and other incidents in which the people we trust harm us or our loved ones. We provide the caring and empathetic service that can only come from someone who’s been in the same situation as the person being served. We are quick to hire the best and brightest people in the particular professional field that is required to win your case; people such as engineers and doctors. 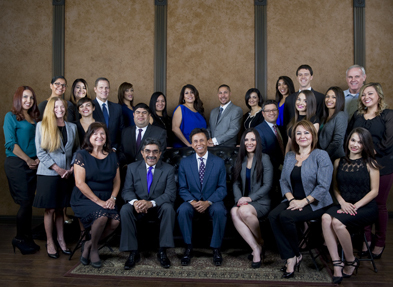 Together, we form a formidable team that protects the rights of our clients against insurance companies and their lawyers who will do everything possible to avoid being held accountable for the harm they have caused our clients. As a Bakersfield law firm, we primarily serve local clients, but yet have also represented accident victims in Nevada, Arizona, Louisiana, Texas, Mississippi, New Mexico, Washington and other states. Regardless of your location, when you need a really good lawyer, contact Rodriguez & Associates. At Rodriguez & Associates, we don’t put electronic barriers between us and our clients. We treat you like family. We care for you like family, because at the end of the day, we are in this together. To schedule a no-charge consultation, please call 661-323-1400 or 800-585-9262. The vast majority of attorneys in the U.S. hold an undergraduate degree in one of the humanities or social sciences, such as history, political science or literature. At Rodriguez & Associates, lead lawyer Daniel Rodriguez obtained an engineering degree immediately following his graduation from high school. How does this benefit you? Following an auto accident, accident reconstructionists and engineers often work to strengthen the victims’ claims by reconstructing the accident. Also,product liability cases involving auto crashes may call into question the safety of the design and manufacture of things such as seat belts, air bags, braking systems and, vehicle rollover protection systems. Attorney Rodriguez’s training in metallurgy, mechanics, forensics, ballistics and other facets of engineering enables him to dig deeper to obtain more relevant information when questioning defendants and witnesses. Why is this training and education important? Because in many cases attorney Rodriguez has been able to find exactly where it was in the manufacture and design of a particular product that the culprit corporation chose to cut corners on safety at the expense of the buying public. More importantly, he’s been able to show how those bad choices wound up hurting or even killing a user of the product. This training is something that helps him put together the best possible case for the client. Something that other lawyers without this training and education might miss.